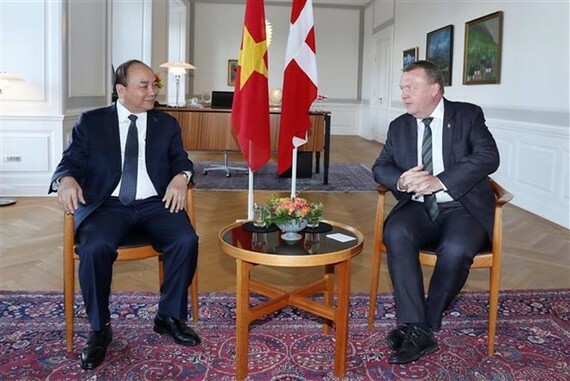 Prime Minister Nguyen Xuan Phuc has affirmed that Vietnam always treasures the development of friendship and comprehensive cooperation with Denmark, its important partner in Northern Europe and the European Union. He made the affirmation during talks with his Danish counterpart Lars Lokke Rasmussen on October 20 on the occasion of his official visit to Denmark and participation in the Partnering for Green Growth and the Global Goals 2030 Summit held for the first time in Copenhagen, Denmark. Rasmussen spoke highly of Vietnam’s socio-economic performance and commitments to sustainable development and climate change response. He expressed his belief that the visit will boost bilateral comprehensive partnership, stressing that Denmark will continue to be a companion of Vietnam in the near future. Both sides expressed their delight at the positive development of bilateral ties, with two-way trade surpassing 660 million USD last year, or a four-fold and two-fold increase from 2005 and 2010, respectively. Denmark’s investment in Vietnam tripled to more than 680 million USD in the past decade. Strategic partnerships across the environment, green growth and energy have also thrived. Denmark assisted Vietnam in the implementation of the national target programme on climate change response with practical projects nationwide, as well as shared experience in carrying out the national target programme on effective energy use and the national strategy on green growth, and helped Vietnamese small- and medium-sized enterprises adopt measures to effectively use energy, and make smart investment in clean energy and construction of energy-saving buildings. The two PMs stressed the need to push forward the effective development of bilateral comprehensive partnership towards the 50th anniversary of bilateral ties in 2021. PM Nguyen Xuan Phuc asked the Danish government to continue Denmark’s Growth Strategy to Vietnam and encourage Danish firms to boost investment in Vietnam in fields of its strength such as maritime transportation, seaport building, shipbuilding, renewable energy, green technology, animal husbandry, sustainable fishery, food processing, pharmaceuticals, health care and education. 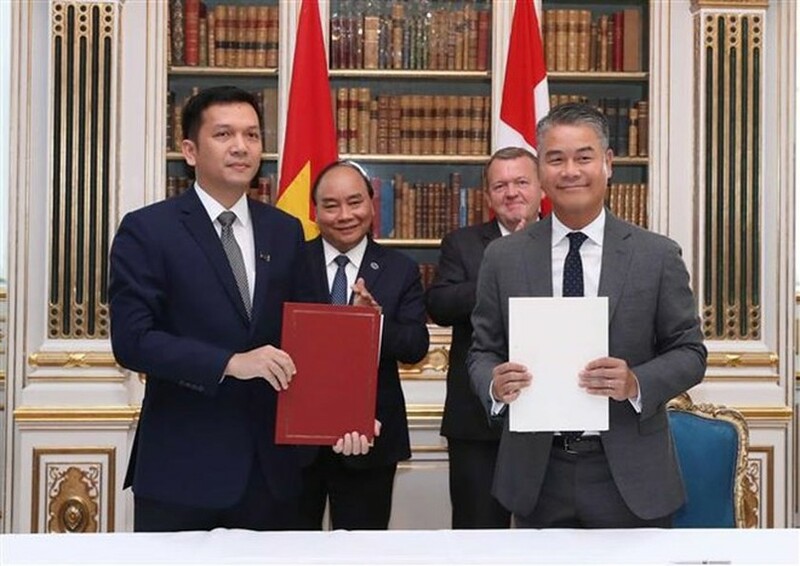 The host affirmed that Denmark supports the early signing and ratification of the EU – Vietnam Free Trade Agreement to materialize great economic benefits to both sides. The two sides expressed their satisfaction with the positive outcomes of the roundtable between the Vietnamese PM and leading Danish firms during the stay. They discussed continuing strategic projects in the fields of climate change response, vocational training, health care, sustainable agriculture, food processing and clean energy. Host and guest agreed to foster closer ties between ASEAN and the EU, and between ASEAN and Denmark. 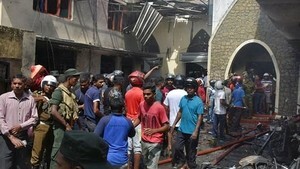 The Danish PM committed to supporting efforts to promote peace, stability, cooperation and friendship in the region and the world, including the East Sea, affirming the importance of the settlement of disputes by peaceful means in line with international law. The two leaders expressed their determination to reinforce bilateral ties during a meeting with the media later. Following the talks, they also witnessed the signing of several cooperation agreements, including an agreement on low-carbon emission development between the Vietnamese Ministry of Industry and Trade and the Danish Ministry of Energy, Utilities and Climate; a strategic cooperation agreement on sustainable development and food safety between the Vietnamese Ministry of Agriculture and Rural Development and the Danish Ministry of Environment and Food; a letter of content on food safety in pork value chain between the Vietnamese Ministry of Agriculture and Rural Development and the Danish Ministry of Environment and Food. They also saw the signing of a letter of content on strategic partnership between the Vietnamese Ministry of Health and Danish Ministry of Health, another on the second stage of a strategic cooperation project between the Vietnamese Ministry of Labour, Invalids and Social Affairs and the Danish Ministry of Education, and cooperation deals between Denmark’s Grundfos and Dong Nai Plastics JSC, and between Denmark’s Vestas and Vietnam’s N&G Group.